With the ninth anniversary of the Sonics’ departure for Oklahoma City having recently passed July 2, the All-Star festivities were one of those periodic reminders of the power of a community coming together for a sports event. The proud but fraying old building might soon be razed to prepare for a dazzling resurrection — or so it has been billed. The future of the site remains the most polarizing topic in Seattle politics, a source of intermittent bitterness for 364 days out of the year. But on this Saturday, none of that mattered. Filled nearly to the rafters with 15,221 fans, KeyArena was rocking again, a paean to its glorious past and perhaps a harbinger of a prosperous future. They all but blew the iconic roof off the place. The crowd came to honor the world’s best women’s basketball players, gathered for the WNBA All-Star Game. Beyond that, they came to heap love and adulation on two of their favorite daughters, Sue Bird and Breanna Stewart, whose every appearance and every move was rapturously received. For the record, the West won, 130-121, but you’re free to now forget that result, because it was way down the list of notable take-aways. What shined far brighter, for starters, was the freewheeling display of pre-eminent talent, mostly unencumbered by the burden of any serious effort to stymie the resulting offensive showcase. “The defense? It was pretty nonexistent,’’ admitted Stewart with a smile. At one point, in fact, the West squad on the court cleared out to allow 6-foot-6 Jonquel Jones — the game’s breakout star with 24 points and nine rebounds for the East — an open shot at a dunk, which she thunderously converted. Less successful, but the source of much merriment, was Stewart’s failure to convert a layin after a dazzling behind-the-back pass from Bird, earning the younger player an amused rebuke. Maya Moore of the Minnesota Lynx, named the game’s Most Valuable Player for her 23-point effort, tactfully said there were “flashes of regular-season moments.” Candace Parker, another top name in women’s basketball, said players meted out their defensive intensity in waves. But what shined brightest on this afternoon, which brought out the best and brightest of our sports scene, past and present — including Bill Russell, Lenny Wilkens, Fred Brown, Megan Rapinoe, Gus Williams, Dwane Casey, Isaiah Thomas, Richard Sherman and K.J. Wright — was the universal appreciation for Seattle as host. 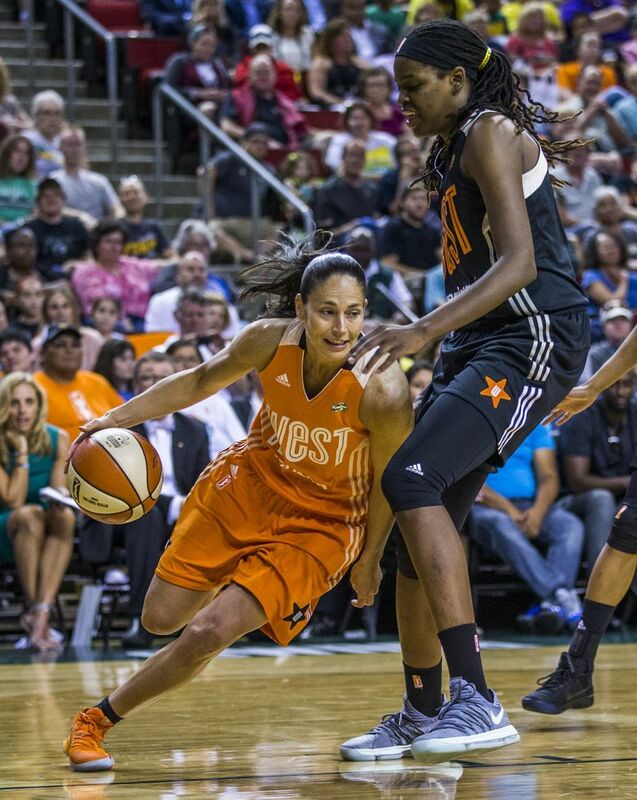 “That was just a wonderful weekend, to put a show like that out for the fans that appreciate basketball, that appreciate it played the right way,’’ added Diana Taurasi, playing in her eighth All-Star Game. “This fan base is one of the best I’ve ever seen in any sport, in any country I’ve played in. That’s a testament to how much they love basketball. Like every All-Star Game, it featured a winning mix of established superstars and younger players just making their mark. Bird, in her 10th All-Star Game, and Stewart, in her debut, represented that dichotomy, as Bird poignantly noted. With the ninth anniversary of the Sonics’ departure for Oklahoma City having recently passed July 2, the All-Star festivities were one of those periodic reminders of the power of a community coming together for a sports event. It has certainly happened over the years for the Storm at KeyArena, particularly in their championship seasons of 2004 and 2010; the electricity Saturday awakened in Stewart a yearning to get that vibe back. 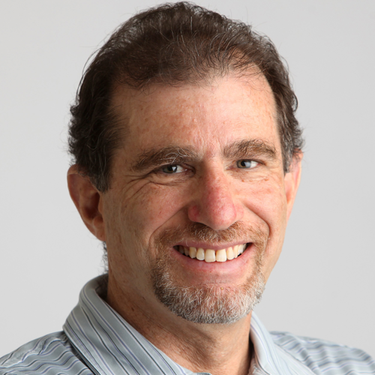 It was also a reminder, Bird said, that Seattle is a basketball hotbed. And especially when it comes to celebrating their own. 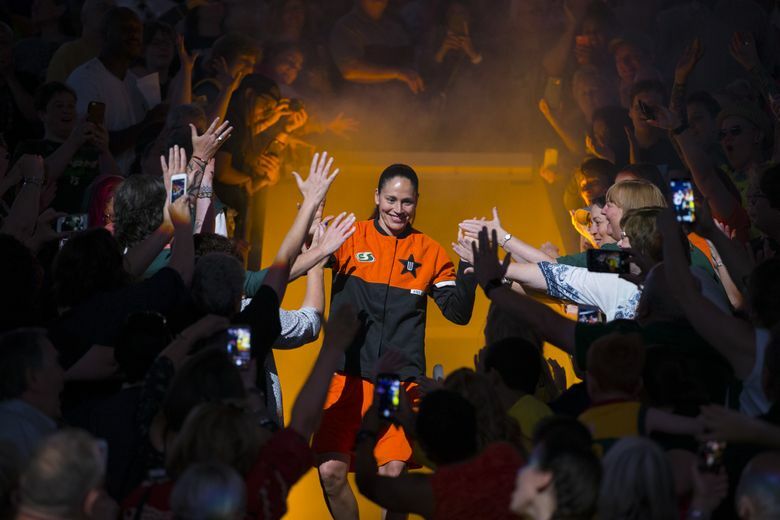 “I can’t imagine being Sue Bird and feeling that energy and passion from the fans,’’ said Cheryl Reeve of the Minnesota Lynx, the West coach. MLB July 10, 2001 Safeco Field, 47,364 Cal Ripken Jr.